The “Verein für jüdische Geschichte und Religion” (Association for Jewish History and Religion) currently has almost 500 members in Germany and beyond. Since 1999 the Museum has received ongoing support from the “Jewish Museum of Westphalia” Foundation, and since 2015 also from a sponsor group. The Museum is run by the “Verein für jüdische Geschichte und Religion” (Association for Jewish History and Religion) which was established in 1987. It produces publications, organises research and educational work as well as study tours and publishes the journal “Schalom” (siehe „Veröffentlichungen“). Members of the Association can attend our exhibitions free of charge and pay a reduced charge for most of our events. The annual membership fee is 40 Euros per person (reduced to 25 Euros for students and pensioners), 50 Euros for couples and 260 Euros for corporative members (associations, church communities, organisations). We welcome new sponsors, donors and members. A membership application form can be found here. I hereby submit my application for membership of the Verein für jüdische Geschichte und Religion e.V. I hereby authorise the Verein für jüdische Geschichte und Religion e.V. to collect payment from my account by means of direct debit. I shall also instruct my bank to honour direct debits drawn on my account. Information: Within eight weeks of the debit date I may demand that the amount paid be refunded. The terms agreed with my bank shall apply. Donations are always welcome because we want to make sure that the Museum remains an attractive place and thus face huge challenges. For more than twenty years the work of the Jewish Museum of Westphalia has lived from the support of people who support us through their work and donations. The non-profit status of the Association is regularly reviewed by the financial authorities. All budgetary closures of the Museum are examined by an accountancy firm and the Museum auditors and approved by the general meeting. Every year a detailed written report on our activities is presented. Since 2015 a group of sponsors have paid more than just their membership fees. This money does not cover everyday expenses but is used, for example, for special school projects or the purchase of new exhibits. As a “thank you” you receive an invitation to a special event every year and also a free guided tour of the Museum for you and your friends. At request we also publish your names in our annual report. More information (and an application form). The Jewish Museum of Westphalia Foundation was established in 1999 with the help of the regional government of North Rhine-Westphalia to ensure the work of the Museum in the long term. 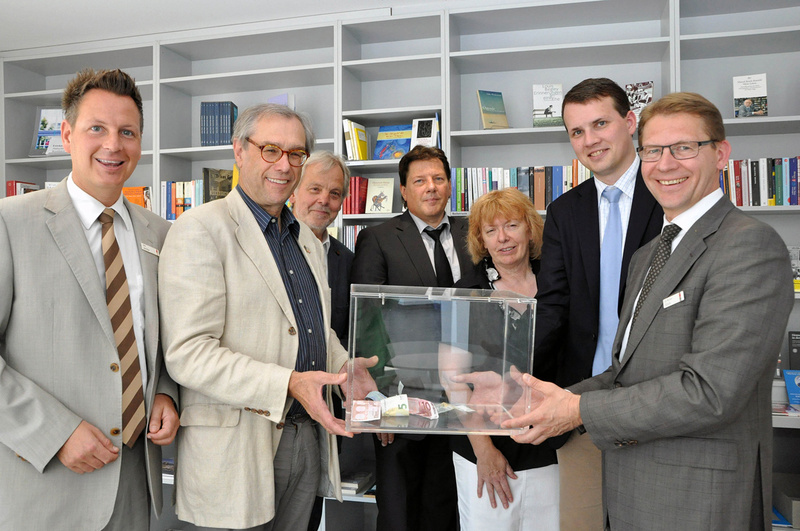 The Foundation is supported by the District of Recklinghausen and the Sparkasse Vest Recklinghausen. We receive regular contributions from the foundation’s fund (interest and donations) in particular for personnel costs of the Jewish Museum, occasionally also for individual exhibition projects, The Board of the Foundation and the Association endeavour to increase the Foundation’s capital because in the long term we cannot expect to be able to rely on so many volunteers. If you would like to help, please contact Ms Brinkert from the museum management. As a donor you can help to ensure the long-term work of the Jewish Museum of Westphalia (through a gift, inheritance etc.) In a foundation, assets are invested on a long-term basis: it is only the proceeds (interest) from the foundation’s capital and other donations that are used. The State Regulatory Office for Foundations regularly monitors compliance with the purpose of the Foundation. We are always very happy when Members of the Association and friends of the Museum make contributions of any amount (donations) to this important Foundation. The Verein für jüdische Geschichte und Religion will be happy to inform you of the bank account. Maybe you have inherited money and would like to support a good cause. Maybe you would like to include a donation to a cultural or educational institution in your will. Have you ever wondered where your money should go after you have passed away? If you have made provisions for your family, or maybe do not have a family, you might like to think about including a non-profit organisation such as the Association of the Jewish Museum of Westphalia in your will. By doing so, you will be helping to ensure our important work.